I know, I know, you've seen a great deal of this hunky fellow in the past few weeks. Well, when life tempts you with a handsome, high performing, all-around great guy, you might as well revel in him. After all, love is like chocolate - there's never too much. 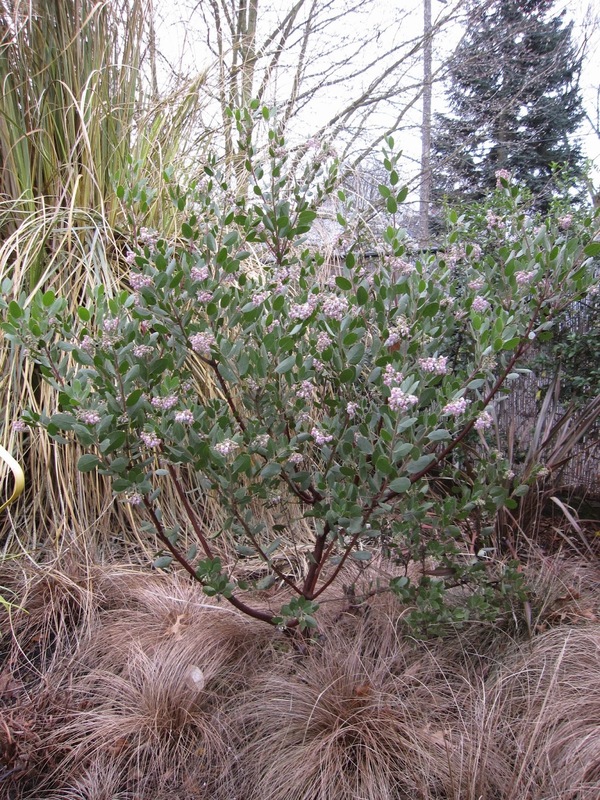 My current Arctostaphylos x 'Austin Griffiths' is my second in the garden: In the spring of 2009, I first became infatuated with 'Austin' in my garden. But an ill-advised move in 2010 killed him. I felt awful and replaced him immediately with another, and that one has featured in February and March Bloom Day posts for the last four years. This year, 'Austin Griffiths' brightened my January Bloom Day post and has been a welcome sight in the garden all winter. Its soft pink flowers are a gentle counterpoint to its gray-green leaves and the surrounding muted tones of the winter garden. Its peeling, deep mahogany bark, while not yet quite as showy and shiny as some of the better-known manzanitas, is nonetheless striking. One of the features I liked about 'Austin Griffiths' is its upright habit. Many Manzanitas are wider than they are tall, so this one is a better fit in my narrow garden. The Favorite Plant meme is hosted by Loree at danger garden. Check out the comments on her latest "Favorite" post to see what other garden bloggers are featuring this week. It's Garden Bloggers Bloom Day! Hosted for seven years now by Carol Michel, of May Dreams Gardens, Bloom Day is a look at what's blooming on the 15th of each month. I began posting sporadically for Bloom Day in June of 2010, and my posts have been consistent for about the past 2 1/2 years. I'm really appreciating the structure this meme gives my visual records of the garden. This month, there are some flashier blooms indoors, but first let's look outdoors. Arctostaphylos 'Austin Griffiths'. I showed this in early bloom last month, and this month it is well into full coverage. A brilliant hummingbird buzzed me as he swooped in for a sip here yesterday. Primula veris is still in bloom! Rosemary is a reliable January bloomer and like the two above, I also showed it in December. I've been forcing Daphne odora 'Aureomarginata' blooms indoors, but the outdoor blossoms are still pretty tight. The same is true of Camellia sasanqua 'Yuletide'. Our three plants lost a lot of buds after the December cold spell so it will be a poor show if and when they do finally unfurl. Moving indoors, I showed this NOID Streptocarpus last month - it's still blooming. Another Streptocarpus in its first bloom after being repotted. It's not a lot, but it counts! I've been enjoying Clivia miniata 'Belgian Hybrid Orange' for weeks now. And see the slim flower stalk to the left of the bloom? It's from a Dyckia hybrid and I'm thrilled to have its tiny orange and yellow blooms in the house this month. What's blooming in your garden this month? Check out the fun and more blooms at May Dreams Gardens. Last week I extolled the virtues of Carex buchananii, a mounding brown grass that's a real plus in my winter garden. Continuing the theme of critical garden evaluation, this week I'm decrying the ugliness of two other mounds of brown in my winter view. 'Sunset Red' long ago reverted to a plain yellow flower, probably because it now gets less sun than it would like. It's nice enough in summer, but not what I bought it for. 'McKay's White' is delightful for three or four months of the year when it's covered with tiny simple white blossoms. But look at it now (and I do every day) - it's not doing anything for the garden. It takes up precious space at the front of the border when it's not even green, let alone not blooming. I've always liked the finely cut gray-green leaves and slightly tough look of Potentilla foliage. When I planted these two I was under the impression that they were semi-evergreen in our climate, but that hasn't been the case for mine, even in mild winters. For several years, the Mulch Man has lobbied for my taking them out and I've resisted. This year, for the sake of our winter view, I've reluctantly come to agree with him: Those two brown blobs have got to go. Having made the difficult decision to remove them, the fun comes in deciding what I'll find to take their places - stay tuned for exciting spring developments! I'm not much of a garden designer when it comes to winter interest. I love summer, bright color and lush foliage so much that they usually take precedence in my plant selections. So I'm indebted to my plant of the week for its role in adding a small measure of structure, color and coverage to my winter beds. Its fecundity has resulted in many free plants for me over the five years since I started growing it, and its appeal in my garden is in the way the mounding groups of plants cover bare soil, especially in winter. I find the older plants get a bit big and scruffy, so I prefer to use younger one- and two-year-old plants in the garden - I always have plenty of seedlings available for the job and they're easy to transplant. Here's what Monrovia has to say about Carex buchananii. Average landscape size: Moderate growing 2 to 3 ft. tall and wide. I have this New Zealand native sedge around the base of Arctostaphylos x 'Austin Griffiths' because mine seem to manage with no supplemental water in summer, perfect for 'Austin Griffiths'. I like the way the brown enhances the mahogany color of the manzanita bark and the bronze foliage of the flax in the background. 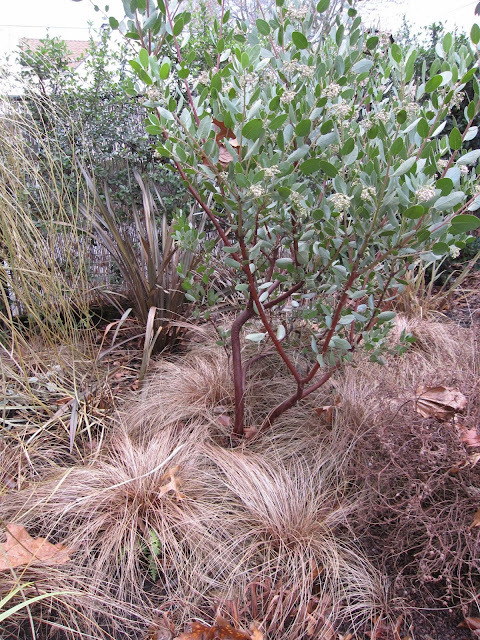 New Zealand Hair Sedge works as a lovely brown accent in between many showier summer players, but I'm taking real delight in its addition to the look of my winter garden. This post joins in the "favorite plant of the week" meme over at danger garden. Check the comments there for more favorites from other garden bloggers this week.